(MICHAEL SPENCER/The Stanford Daily) Students participated in anti-Trump protests after the election, demanding that Stanford become a sanctuary campus. A group of Stanford students and faculty members has joined forces in an ongoing effort to make Stanford a safer place for undocumented immigrants. Galvanized by the election of President Donald Trump last November, student group Stanford Sanctuary Now (SSN) demanded that Stanford protect all students and staff at risk of deportation by keeping their immigration status private and providing them with legal assistance. In recent weeks, faculty members have also taken up SSN’s cause. Amid negotiations between the University administration and SSN, the Program in Writing and Rhetoric (PWR) issued a statement of support for the cause in January, followed by a letter signed by a group of 200 faculty members from various departments calling for more “assertive” response from the University. 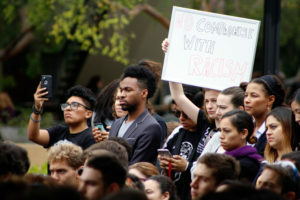 The PWR letter demanded that Stanford avoid disclosing information to Immigration and Customs Enforcement about the immigration status of students, faculty or staff, provide financial and legal resources to individuals in danger of deportation, as well as explicitly adopt need-blind admissions for undocumented and international candidates. According to SSN member Kari Barclay, a first-year Ph.D. candidate in theater and performance studies, the faculty initiatives bring much-needed solidarity and longevity for the sanctuary campus movement. Signed by faculty from multiple disciplines, the second letter presented a more emotional argument that contrasted with the legal specificity of the PWR letter, a contribution that SSN said added important rhetorical dimension to their platform. Faculty leader David Palumbo-Liu echoed the passionate tone of the letter. The PWR department and the multidisciplinary faculty cohort joined SSN at their town hall meeting last week, which Barclay described as a visible step toward “building a coalition between different campus groups” and “putting these organizations in dialogue.” In the meeting, 115 student and faculty attendees discussed SSN’s platform, planned events in solidarity and prepared for future conversations with the administration. The letters from students and faculty came in response to a perceived lack of specific policies that protect undocumented students at the University. While administrators have published a series of statements in response to mounting concern following the election and President Trump’s executive orders on immigration, SSN has sought more concrete proposals and action. After the November election, the University published a statement reaffirming its support for the DREAM Act and DACA, two protective policies for undocumented students that Trump has threatened to abolish. SSN said that they were pleased with the University’s tone in its statement, but had hoped to see more policy specifics. SSN provided more specific demands in late January, which first drew the support of instructors and faculty. President Marc Tessier-Lavigne, along with then-Provost John Etchemendy Ph.D. ’82 and Provost Persis Drell, commented on these issues with a more detailed statement on Jan. 29. In the statement, they affirmed the University would use need-blind admissions for undocumented students, voiced support for federal legislation that would protect undocumented people and articulated core policy values of privacy and inclusivity. The University’s statement was met with differing responses from the groups involved. Schwartz expressed optimism about the University’s stated goals, which she said was in line with her cause. “I see a great deal of concern [from the University] about the effect of the executive orders and the possible intent to deport students,” Schwartz said. Palumbo-Liu also commented that collaboration and cooperation with the University seemed within reach. However, members of SSN lamented that they have yet to see a detailed action plan from the University. Barclay added that the latest statement has not fully addressed community members’ fears, especially those of campus workers. To bring about concrete policy outcomes, the sanctuary campus coalition aims to work with University administrators in continued negotiations. The coalition is currently preparing for a meeting with University administrators on Feb. 16. Barclay laid out various goals that SSN has for the meeting, the most pressing of which is communicating the longevity of their efforts. Barclay added that participation by faculty members, who are able to remain at Stanford and support the cause for the long-term, help SSN communicate the seriousness of their message.